Welcome to Mini Maestro Piano Learning for the IPad. This revolutionary program has added features that enable your child to easily learn to read music, understand rhythms, and play the piano. Each lesson is filmed with a music teacher and an actual piano student. The program includes interactive software that enables the student to play along. Your child will have fun while they learn to play the piano in the comfort of your own home. Beginners can start with lesson one and progress through the program. Since all children learn differently, this interactive application gives your child the convenience of doing the lesson and learning at their own pace. Give your child the gift of music that will last a life time as they aspire to their musical desire. Read the Mini-Maestros press release. 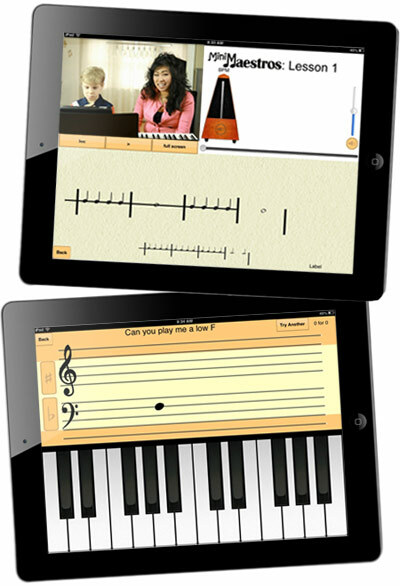 Check out the information on this website and view the screenshots of the Mini-Maestros Piano Learning application. Then, follow the link to the iTunes Apps store to get started today!